This recipe for Key Lime Pie Ice Cream makes me extremely happy. Seriously. It’s probably one of the best flavors I’ve ever had. 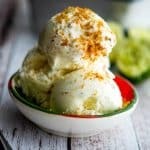 As some of you may know I’m not a huge ice cream fan, but certain flavors certainly grab my attention and Key lime is one of them. Key lime pie is one of my family’s favorite desserts, but I’ve never made it at home. I did make a Key Lime Tart once. I guess it’s because the light, citrus flavor reminds me of summer and I usually indulge in a slice of pie whenever we vacation on the Gulf Coast of Florida so for me I guess I associate it with vacation and having a special treat. When I saw a recipe for No Churn Key Lime Pie Ice Cream on Pinterest last month created by Like Mother, Like Daughter, I couldn’t wait to try it for myself. In their recipe they used sweetened condensed milk along with the heavy cream, but since I have my handy, dandy ice cream maker I adapted their version to use with my machine. I had never made ice cream without it, but their version looks just as creamy so I’ll definitely be trying a ‘no churn’ ice cream version to share with you in the coming months. Making your own ice cream at home is so easy too and I like knowing what’s going into it. Combine milk and sugar in a bowl; then blend until the sugar is dissolved. Stir in heavy cream, vanilla extract (I use Madagascar vanilla), fresh Key lime juice and zest, mix until blended; then pour into your ice cream maker. Combine the crushed graham crackers, butter and sugar and bake 5 minutes until lightly toasted; cool. Allow mixture to churn and thicken for 30 minutes; then layer the ice cream and the toasted graham crackers in a loaf pan or plastic container and freeze for at least 4 hours. This Key Lime Pie Ice Cream was heavenly! So rich and creamy and a definite new family favorite. I couldn’t get over how much it tasted like the pie. ~Enjoy! The fresh flavor of Key limes and toasted, buttery graham crackers in a delectable ice cream flavor. Combine milk and 1 cup of the sugar in a bowl; then blend together until the sugar is dissolved. Stir in heavy cream, vanilla extract, fresh Key lime juice and zest. Mix until blended; then pour into your ice cream maker. Allow mixture to churn and thicken for 30 minutes. Combine the graham cracker crumbs, butter and the remaining sugar, place on a baking sheet and bake 5 minutes until their lightly toasted; cool. Place half of the ice cream in a loaf pan or plastic container; then add half of the toasted graham crackers. Repeat a second layer of each; then freeze for at least 4 hours. 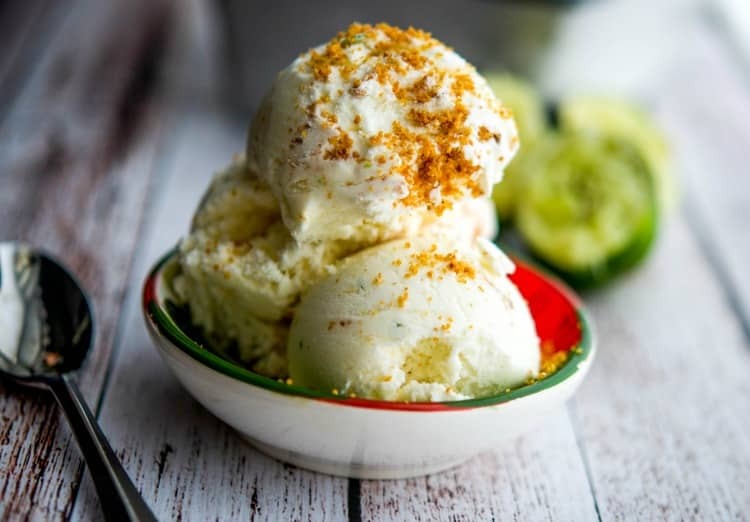 I’m so glad you were inspired by my no churn key lime pie ice cream! I haven’t used my ice cream maker in too long! Your ice cream looks amazing! Aimee I was so intrigued by flavor and the ‘no churn’ aspect, not to mention the fabulous photo! Thanks for the inspiration and I’ll definitely be trying a no churn version over the summer! This looks like the perfect ice cream for summer! Love the flavor of key limes! My family couldn’t get enough of this one so I think I’ll be making it again very soon. 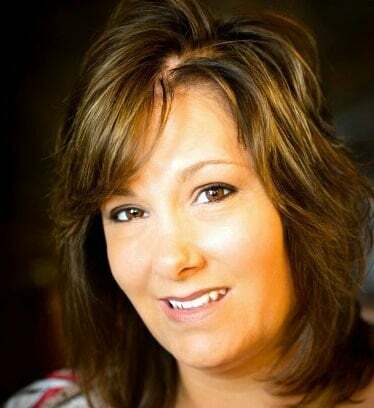 Thanks for stopping by Christin!